Read a ​brief history of the Ojai Valley. ​There are many historic and contemporary articles about a wide variety of subjects for you to read on our affiliate website, OjaiHistory.com. View our detailed timeline at the end of this page to get a sense of when and how the valley developed. Here it is in PDF form. The Ojai Valley: An Illustrated History is the definite book on local history. In 2017 Elise DePuydt and Craig Walker revised and updated Patricia L Fry's original book. As new information arises due to ongoing historical research, further revisions to the book are being made from time to time. The information in the addendum is arranged in two ways with each one containing the same information. One organizes the information alphabetically by topic. and the other is organized sequentially by book page. We celebrated a Jubilee Year from Ojai Day 2016 through Ojai Day 2017. It represented the museum's 50th anniversary and the centennial of the E.D. Libbey-led transformation of dusty Nordhoff into beautiful Spanish-style village of Ojai. Each week a photograph was highlighted in the Ojai Valley News and on our website, as From the Archives: Jubilee Photo of the Week. These are the photographs we highlighted. Political controversy? In Ojai (like everywhere we suppose) it goes way back. At least as far as 1893. Read about the controversy over George Mallory, Nordhoff's postmaster, on our affiliate website, OjaiHistory.com. It's an interesting read; you won't be disappointed. Then you'll know a lot more about the man behind Mallory Way. ​This building, with a pretty blue awning outside and delicious food inside, is on Ojai Ave between the public library and the movie theater. But in the 1950s and 1960s it was home of the Topa Topa Cafe. Read a delightful article written, "Winn's love prompted meat loaf generosity", written in 1989 right here. You're going to love this look back in time. ​When driving into the Ojai Valley from Ventura this sign in Casitas Springs proudly proclaims it as the former home of musical legend Johnny Cash. But long ago the area was known by another name: Stony Flat. Read an interesting short article about cattle drives from days gone by here. It's an article by Howard Bald that appeared in the Ojai Valley News in 1973. ​Every time you walk under the pergola in front of Libbey Park, you pass a water fountain. Did you know it's named for Evelyn Nordhoff? America's first female bookbinder and printmaker, she was the daughter of Charles Nordhoff for whom our community was originally named. Read more about this fascinating woman here, and then go have a drink of water in her honor. This is Howard Bald. You can read more about his interesting life on Ojai History.com right here. ​El Toro Road runs through the Arbolada neighborhood from Foothill road to Del Norte. Have you ever wondered how it got it's name? El Toro is Spanish for The Bull road. This road used to lead to a slaughterhouse located on the west side of the Arbolada, not far from Foothill Road. Read more about it here in a first hand account of early life in Ojai written by Howard Bald. ​This property on Ventura Ave in Mira Monte was Perl's Nursery, then later Clapp's Nursery. But if you go way back to the early 1900s the property was a camp where wood was stored that had been cut from a large area bordered by Villanova school,, through Mira Monte and over to Rice Road. The firewood was undoubtedly shipped to market on the railroad. Read more about it, and local wine, here on OjaiHistory.com. It's another short article written in the 1970s by Howard Bald. This was the Valley Market. Today it is Ace Hardware in Meiners Oaks. Read a short, interesting article about the owner and his business methods here. ​With fires raging in California, we are reminded of the brave men who fought forest fires in the back country in years gone by. Read about some of them in a brief article by Howard Bald on our affiliate website, OjaiHistory.com here. This structure on Signal Street might have been the first US Forest Service Ranger station in Ojai. This is the Woman's Club building located at 441 E. Ojai Ave. The Woman's Club has a long history of working to improve our community. Read more about the club and their long record of service to the valley on OjaiHistory.com. Did you know Fox Canyon along Shelf Road was a shooting range in the 1970s? Read about it on OjaiHistory.com. On May 11, 1946 downtown Ojai was full of people dancing in the street. What was it all about? A folk dancing festival! Read about it on OjaiHistory.com. Water is an important issue in the valley. The Gridley Mutual Water Company installed this water line from the Gridley Ranch water- tunnel to several homes on Foothill Road, including Charles Pratt's and Edward D. Libbey's residences. Read about it and other water projects from a 1946 article on our affiliate website, OjaiHistory.com. ​This is Lake Matilija. Located in Matilija Canyon, it is accessed a few miles out of the Ojai Valley off of Highway 33 in Los Padres National Forest. Read more about the lake and other Recreational Facilities from a 1958 article on the Ojai History . com website. The Ojai Tennis Tournament and more, are included. N​Here is a photograph of Cliff Runte (left) and Ojai Ranger John Parkingson (right) taken inside the Nordhoff Lookout Tower in 1961. The tower was on top of Nordhoff Peak, northward of the Ojai Valley. Read more about the forest in 1961 from an article that ran in the local paper that year. It's right here, on our affiliate website. Did you know that Ojai Valley Men's League changed their name to the Chamber of Commerce in 1927? Read about their founding, the Committee of Fifteen, and other early civic organizations on Ojai History . com. ​Do you know the significance of the Topa Topa Ranch to local history? The Ojai valley's orange industry got its start there! Find out more when you read a short article, Singular Characters, on the Ojai History.com website. Who is this handsome guy? And what is his connection with the Ojai Valley? Reyes Peak and the Jacinto Reyes National Scenic Byway were named in honor of Jacinto Damien Reyes. A long time forest ranger and explorer, he helped extinguish the terrible Matilija-Wheeler Canyon fire of 1917. Read more about him, and others important to the valley in a short illustrated article entitled The Spanish Settlers here. ​Do you recognize this building? It's one of the most frequented buildings in the valley. It started out as Nordhoff Union High School, but today it's the Matilija Junior High gymnasium. Read about it here, in a short article entitled Public Secondary. ​The man in the middle of this c1910 photograph built the Topa Topa, Ocean View and Pratt trails. He is George Bald for whom Bald street in Ojai is named. 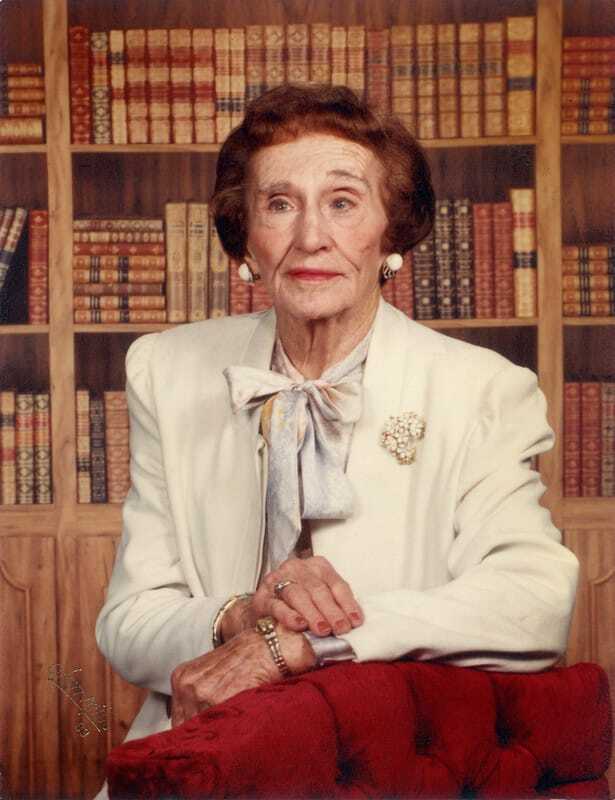 Read more about this interesting person who impacted the Ojai Valley here, on our Ojaihistory.com website. ​This is a photo of the first Ojai Day, April 7, 1917. It was the day the community celebrated the transformation from dusty old Nordhoff into the newly renovated community of Ojai. The name change had just been approved by the government, and the Arcade, Pergola and Post Office tower were newly built. Read about The Meaning of Ojai Day here. ​Where was this photograph taken and where does the walkway lead? You recognize it. ​This archway leads from Ojai Ave to the rear of the arcade. Beautiful today, for decades the area behind the arcade was not very attractive. Read about the transformation with a clickety click. ​This was The George Thacher Memorial Free Library, Ojai's first library. Read about how the library was the center of the community here, in an article written by Mr. Ojai, David Mason. You'll learn it's original location, why it was moved, and when the city's current library was built. ​This is Deepcat Lake. When this photograph was taken it was the second largest lake in Ventura County. Never heard of it? Read more here. It's a vintage article from a local publication c1953 entitled El Rancho Cola. ​Bill Baker certainly fit his name. He baked for locals, and celebrities including United States Presidents. Read all about him, lima bean bread and his bakery here, on our Ojaihistory.com website. His bakery was located at 457 E. Ojai Ave, currently the location of AZU Restaurant. ​This is a ringtail cat (or is it the skinniest raccoon you ever saw?). Read more about these elusive creatures in a short, interesting and funny article here. They were called "miner's cats" because early prospectors used them as mousers. ​If you've never heard of Good Will Day, you'll want to read about it the little-known holiday that used to be celebrated in the Ojai Valley. Go here for a short article about the early public school and its emphasis on world fellowship and peace. ​Water means life, especially for agriculture. This antique water-well drilling machine was probably used onteh Friend homestead on Grand Avenue near San Antonio School. Murky Water is a very interesting read about water and wells, drought and farms. 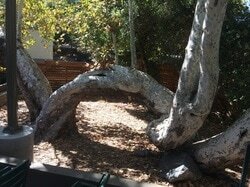 This bent sycamore tree lives on the western side of Libbey Bowl. It is suspected that Native Americans bent the tree when it was young and pliable to note a location of importance. You can read more about the trees in Libbey Park here. ​Effie May Skelton was a force of nature. She was a founding member of the Ojai Valley Museum and manned the museum for 20 years as a volunteer! Click here to read more about this dynamic lady who started from small beginnings (she only weighed 1 1/2 pounds at birth!) and really made a difference by saving and sharing the history of the Ojai Valley. ​This is Edward D. Libbey, a glass manufacturer (Libbey Glass) from Toledo, Ohio. He built a home on Foothill road and a barn at the upper end of Del Norte Road. Through his efforts, Ojai was transformed. Read all about it here. ​​After laying out the town, Royce Gaylord Surdam wanted to name it Topa Topa. But he yielded to the request of hotel owner Mrs. Blumberg, who suggested Nordhoff. Can you guess how much an acre of land in the new town cost? You'll probably be shocked. Find out the cost, along with more about Surdam and the town's formation in a short article just by clicking here. ​This is Robert Ayers. He, his wife and their seven children were the first American family to settle in the Ojai Valley. Read more about the Ayers when there were no roads in Ojai here. One of Robert's son, Frank Ayers, built a house that still stands on Grand Ave.
1966 – The city population closes in on 6000 – The Ojai Valley Historical Museum & Historical Society is founded – The Ojai Unified School District is formed – Nordhoff High and Matilija Junior High trade schools – City Hall moves to the former Baptist Church site on Ventura and Matilija Streets – Wayne Glasgow buys the Ojai Theater and renovates it with a Scottish motif. 1974 - Beatrice Wood moves her studio to Happy Valley – A Montessori School opens on Baldwin Road – The U.S. Bureau of Reclamation starts buying land in the Ventura River watershed surrounding Lake Casitas to create the 3,500-acre Teague Memorial Watershed, banning development around the lake. 1996 – The Ojai Valley Museum moves into the former St. Thomas Aquinas church – The former Bank of America building east of Libbey Park is renovated into shops and galleries (designed by Marc Whitman) – The National Disaster Search Dog Foundation was founded by Wilma Melville – The first concert in the new Libbey Park bandstand takes place – The Ojai Valley Library Foundation and the Ojai Library set up a SchoolLinks Homework Center – The Taconic Resources county-wide March ballot, Measure T, which put construction of the Weldon Canyon dump before voters, was defeated – Theater 150, a professional theater company, begins productions in the former Clausen funeral home on East Matilija Street. 2002 – Cluff Vista Park dedicated – The Arcade Plaza redevelopment completed – Food for Thought founded to work with the school district on food issues in the schools – The Ojai Valley Toastmasters Club chartered – The Ojai Valley Land Conservancy acquires funds to purchase a nearly 1600-acre parcel on the Ventura River in Meiners Oaks, part of which was once slated for a golf course – The Valley Oak Charter School founded to serve the educational needs of the valley’s homeschooled students – Michael McFerrin renovates the first Presbyterian church building on Aliso and Montgomery Streets.